Nope, that feature was already there in previous versions, and you could also use the widely-spread gpx file format. And yes, GPS-Babel is a brilliant piece of software. What's more than just displaying tracks, but more costly, is the ability to define waypoints 'graphically' in Google Earth and then upload them to a GPS unit. Upyaboya—Ireland has got to be a beautiful place to sail. I’ve never been there but my wife brought back spectacular pictures from there. Clearly, it has to be a bit on the cool side, but dressing right can mitigate that problem. I’m looking forward to hearing about your first trip—with pictures, of course. Regarding the info about the Everglades which I have been providing, it is clear that the Everglades are very threatened. Global warming will ultimately wreak catastrophic effects because most of the area is only 1-2 feet above sea level. Before that time, it is likely the developers in Florida will have their way, tightening the noose and draining more and more water away. 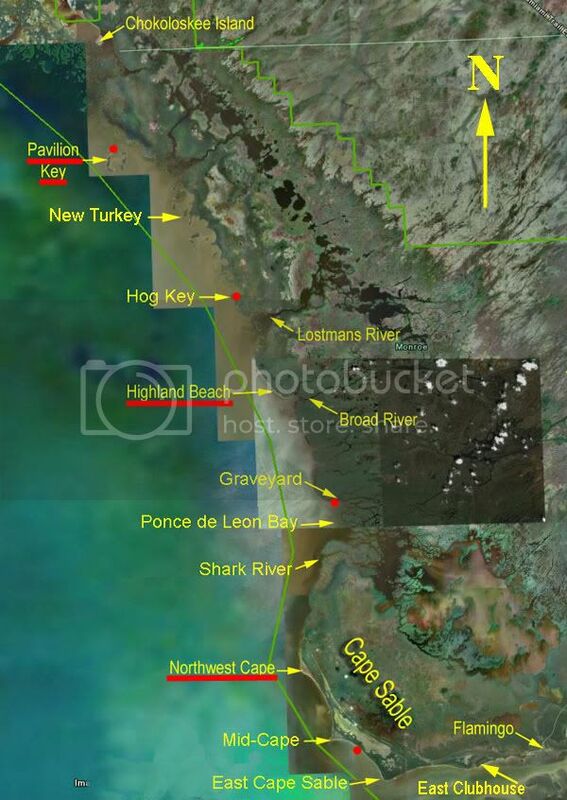 Big Sugar has been polluting the Everglades for years and getting away with it. So, I am very pessimistic about the future. Accordingly, the more people know about the Everglades, the more people will visit and use this international treasure, and, perhaps slow development and Big Sugar pollution. Unfortunately, for the casual visitor, the nature of the Everglades may be lost on them. You have to “live” the Everglades to get to know and appreciate the area. If you and others on this forum get to South Florida, I’ll be happy to join you on a trip to the Everglades. 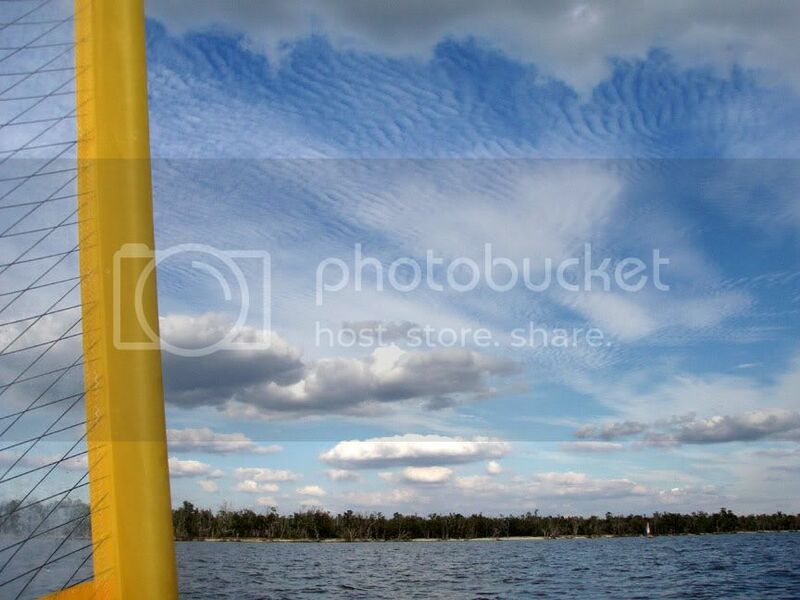 TIDALWAVE—when are you planning to get down to S FL this summer? It will be hot, you know, but that may be just what you need after a winter in Minnesota. If I can be of help for your trip, let me know. ARNO—I’ve protected my Garmin 76 CSx so well that it is too old and does not have the capability to upload GE files. Are you talking about software which is capable of uploading wpts from GE directly into a GPS memory? Or, are you talking about generating a GE file which is then uploaded to a GPS which can accept Google files? Not really as straightforward as what one could dream of, but still beats typing all coordinates in the GPS, after figuring them out of a map. The GPS coordinates format is the tricky part as GPS units often require one that may differ a little. I’ve protected my Garmin 76 CSx so well that it is too old and does not have the capability to upload GE files. Are you talking about software which is capable of uploading wpts from GE directly into a GPS memory? Or, are you talking about generating a GE file which is then uploaded to a GPS which can accept Google files? Keith, I've now got the same model Garmin as you do (thanks for the recommendation). You can save tracks, paths or waypoints in GE as .kml files, then the GPSBabel software can load the files and either send them directly to your GPS or save them as .gdb files, which you can open with Garmin Mapsource and then transfer to your GPS. I've been using it to map the weedbeds in our local estuaries. They are clearly visible in GE, so I draw paths around their outlines, then export the paths as tracks to the Garmin, where they appear on the loaded maps. So, the question is, have any of you done any lengthy trips in an AI? What was your experience? Can you carry 7-gal of water + gear + food? What about a wee distillation kit? You could make that yourself for pennies. Or a plastic bag tied over a bush. Although thats more for a survival situation! Having used an AI for camping trips for almost 2 yrs, my experience is that carrying 7 gal of water during a trip in S Florida is not a problem. Jan 13 Wed Fishing day/relaxing--fish Broad River or Lostman's River. If you don't fish, relax and enjoy Highland Beach. HB is a terrific place to spend some time. Because of tide considerations we must leave tomorrow. We will have a fish fry tonight. 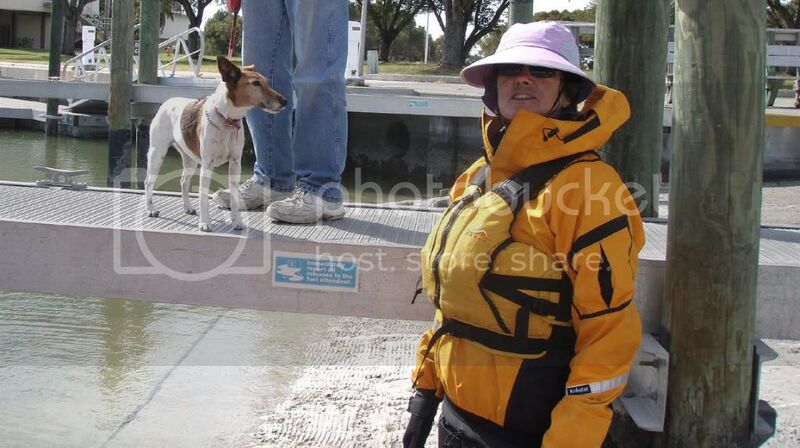 Jan 14 Thursday Hi-Land to Hog Key (7 mi) Catch fish along the way. Fish sandwiches for dinner. If only 2-3 AI owners do this trip, I can arrange the logistics. If there are more, we will have to be creative to shuttle people/cars around. If you have any questions, ask them here or send an email to me at kwellma at gmail dot com. Nice meeting you yesterday and hope you enjoy your second Adventure Island. Keep us updated on our blog, facebook , or twitter with all of your adventures! Sounds like you know how to have them! 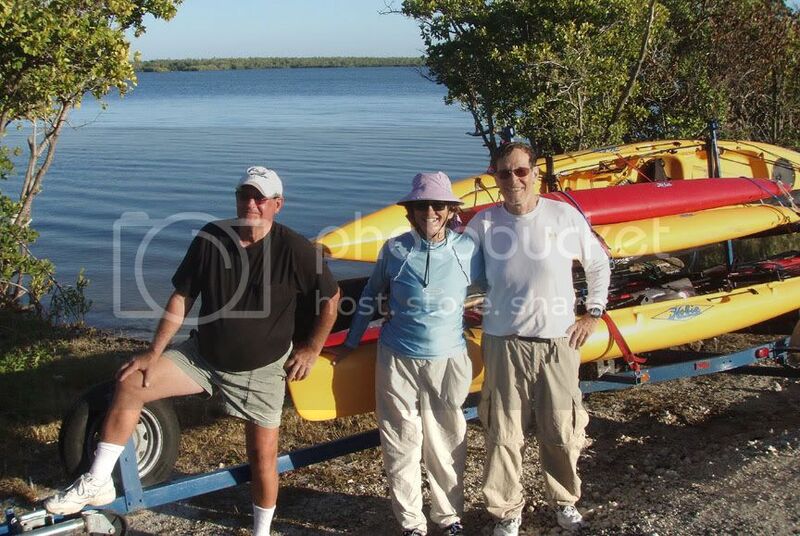 This was my second Adventure Island trip along coastal everglades from Flamingo to Chokoloskee. The first time my boat was new, and I was just getting a feel for AI camping on a 70-mile trip. Last year we did an all sea kayak trip, this year it was an all AI trip. 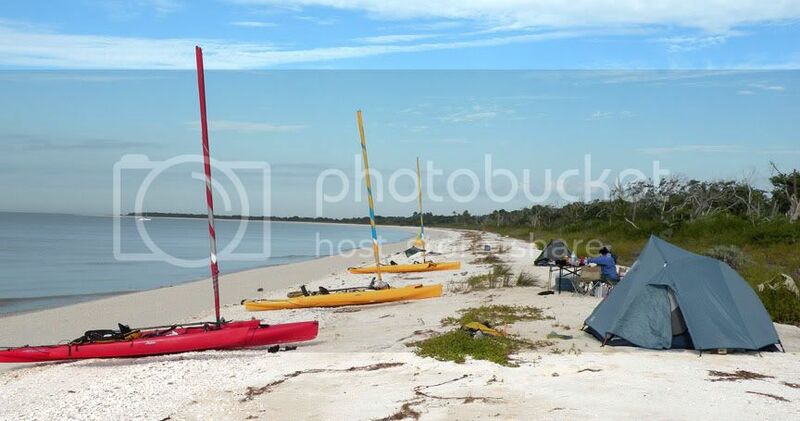 On this 6-day outing, the plan was to do three 20-mile days to get to Pavilion, take a day off on Highland Beach and another on Pavilion Key before sailing into Chokoloskee. 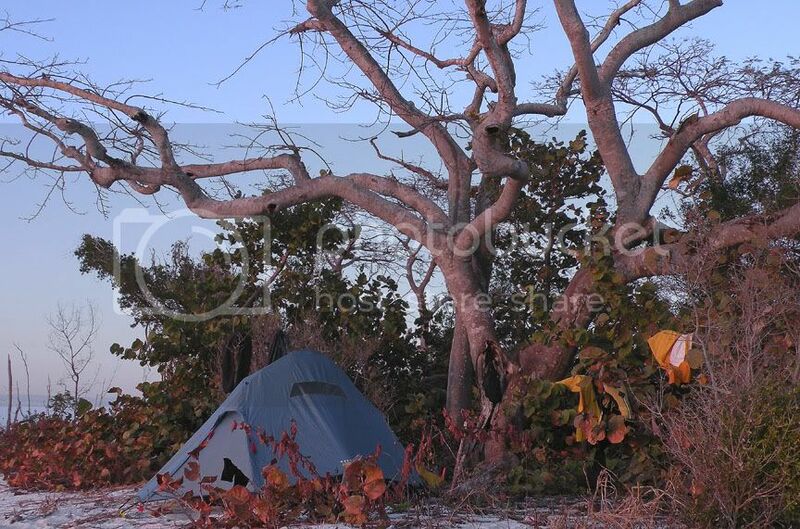 We intended to camp at Northwest Cape, Highland, and Pavilion. In reality it was four 15–mile days with no day off on Highland Beach. We had favorable winds every day. The main reason we did not get our 20-miles/day was because we were an hour late starting the first 2 days. I was also a bit conservative. The first 2 days were cool, dropping into the mid 40s (F deg, that is) at night, and only up to 65 deg F during the day—cool weather to be sailing an open kayak—so I wanted to stop at least an hour before sunset. Also, if you get in late, you may face a slog through thick muck. 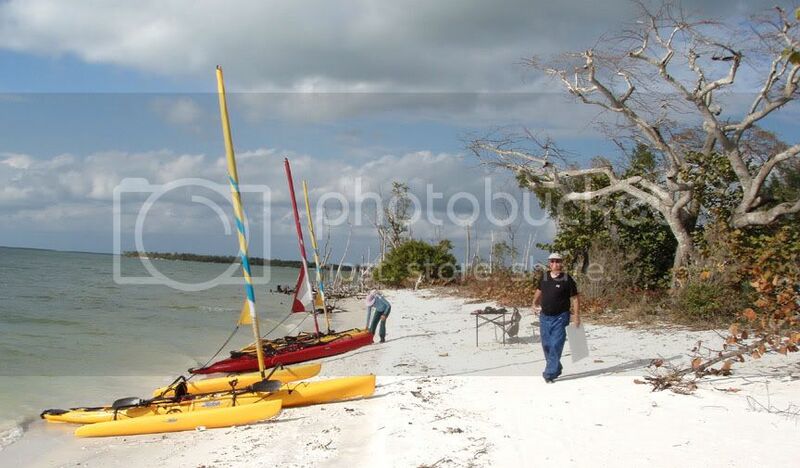 Here Bill Waller pulls his boat up on Scorpion Beach about 3:30 pm on Day 2. You frequently can’t get a jump on the day for the same reason. 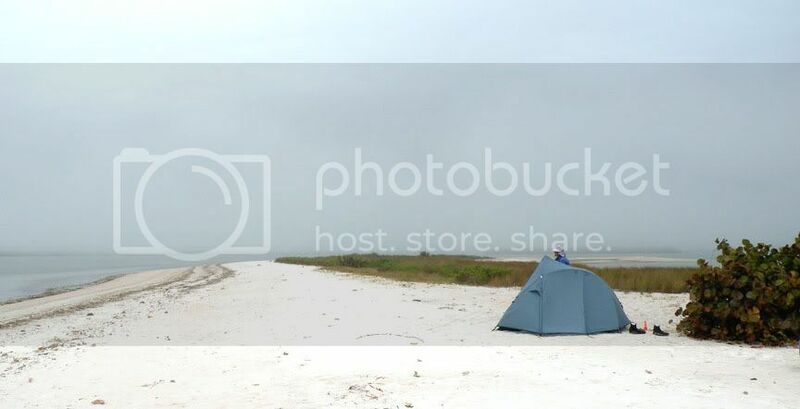 This is Scorpion Beach as we break camp next morning at 10:45 am. The rising tide has barely covered the muck. We will be on the water in about 1 hour. 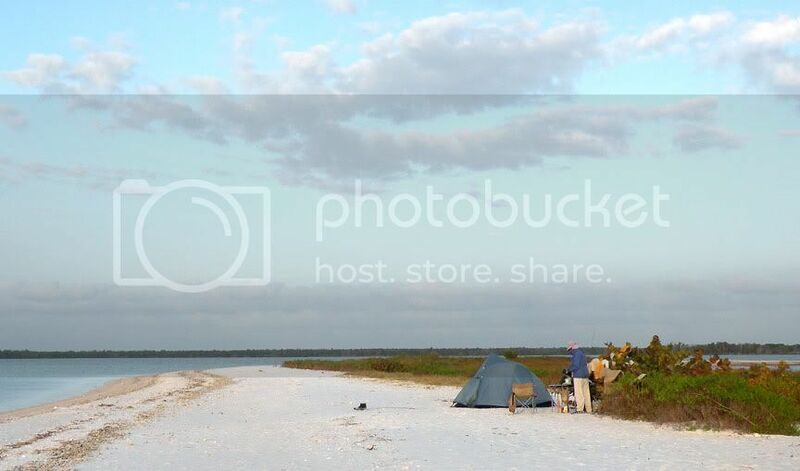 Hog Key morning view from the tent (that is my wife Nancy; she is doing her first-ever AI camping trip). It is not the thick muck of Scorpion Beach, but it would be a slog to get to open water—so we will wait for the tide to come in. The tides frame the window which defines your sailing time. Nancy, myself, and Bill (Polecat) constituted our AI group. Ready to launch from Flamingo Marina. 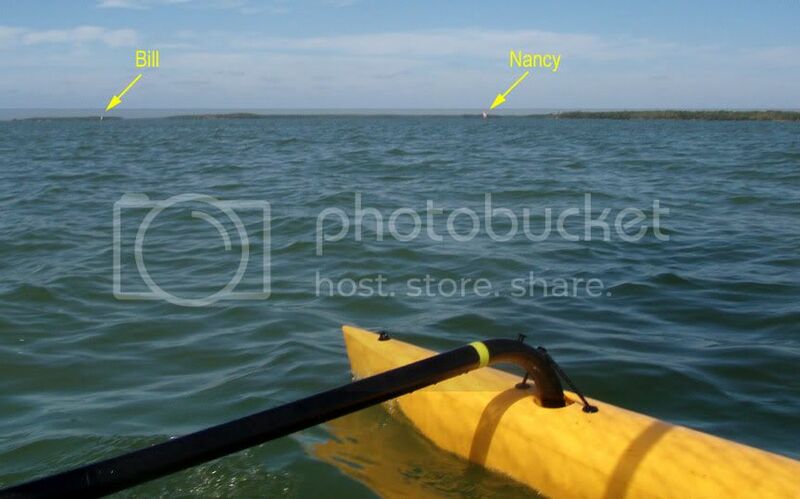 This was only the third time Nancy had sailed her boat—the first 2 times were little, hour-long get acquainted sails. Here she is as we leave Flamingo. Tourist dog watches excitedly. Dressed for a chilly day. Nancy sails out of Flamingo. Nancy and Bill w/ the Oyster Keys as a backdrop. 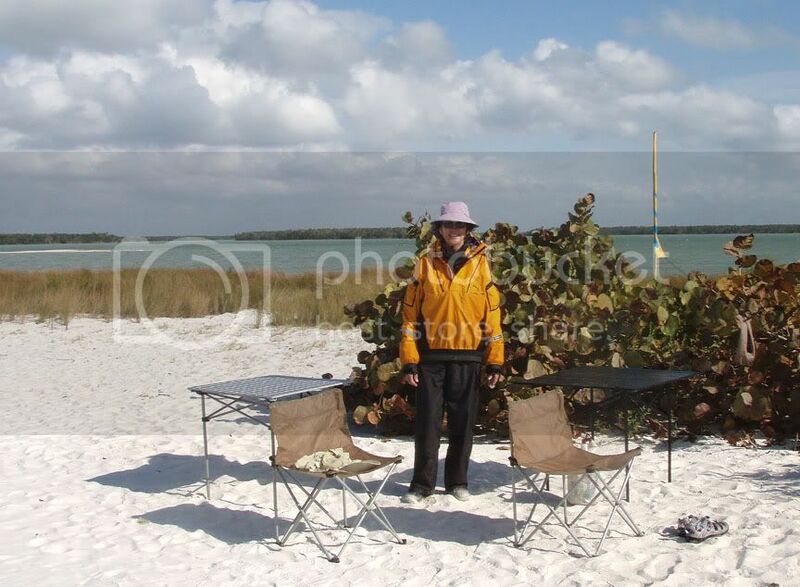 Late the first day, Nancy arrives at our camp, south of Middle Cape Sable. The morning of Day 2. 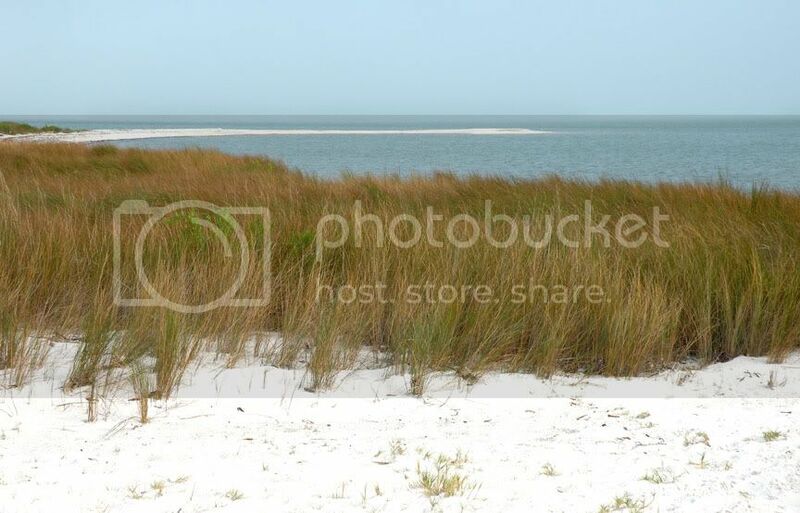 Middle Cape is the point at the left horizon—about 1.5 miles away. The tide is just beginning to come in—still, if we had been ready, we could have been on the water an hour after this picture was taken. Because of the extreme cold for south Florida—temperatures got down to freezing in this area—and because it was such an extended cold spell with strong northerly winds, water temperatures got into the low 50s. Temperatures like that kill many fish both large and small. 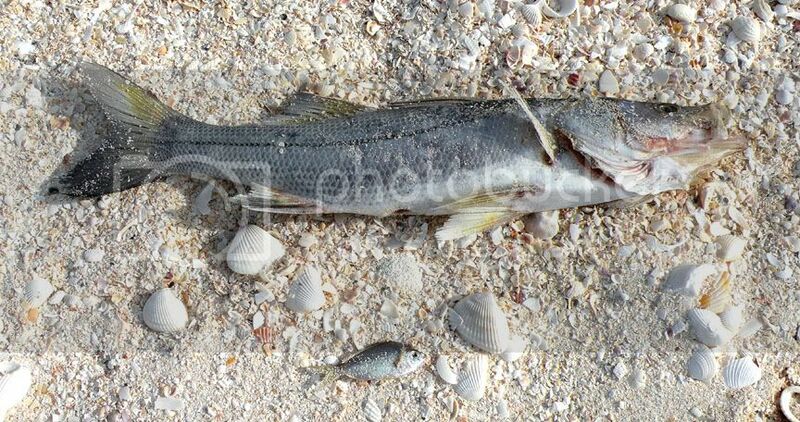 A snook and its prey. The cold was an equal-opportunity killer. I wear neoprene dive booties. These are great in warm weather, but, on the AI, evaporation due to wind can make them very cold. For the first 2 days, I wore garbage bags to keep my feet warm. On Day 2 we perhaps could have made Highland Beach (a 23-mile day), but it would have been nearing sundown and the tide might have run out under us—meaning a real slog—so, we headed for Scorpion Beach near Graveyard. Nancy arriving at Scorpion Beach. Day 3: Nancy takes lead in rounding Graveyard Point. 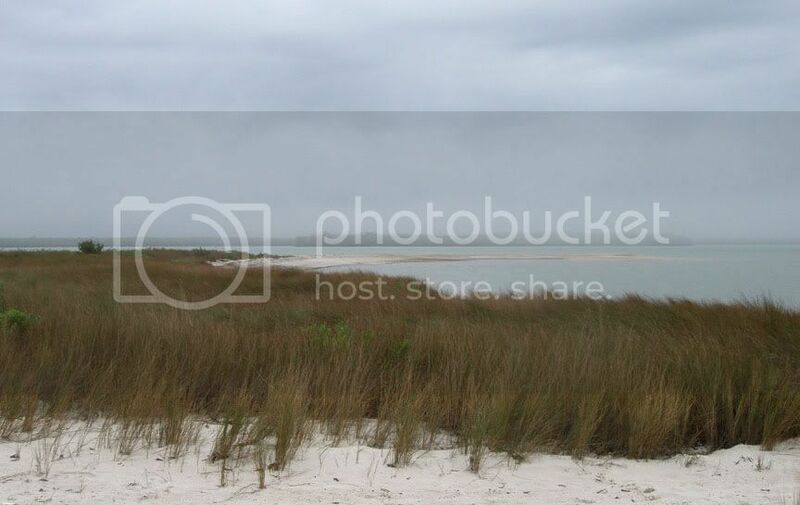 This area was struck by a series of hurricanes in 2004-2005. 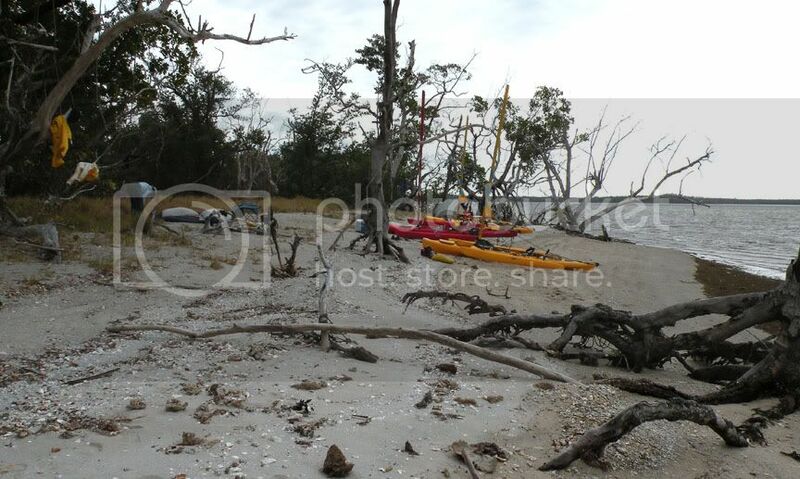 That is the reason for the many dead trees along shore. I don’t want to dwell on the sad fish-kill event, but there were many dead fish in the water between Graveyard and Hog Key—more casualties of the cold weather. On Day 3, it has warmed enough that I am not using garbage bag warmers. Day 3: Approaching Hog Key. Nancy & Bill taking a break. We had wine and appetizers before setting up camp. Each of us carried a separate dry bag with “après sail” warm clothes. That worked out very well, especially on days 1-2. Nancy and I are camped under a “widow maker”—hopefully it is not in a malicious mood for this night. Day 4: as I prepared to launch from Hog, Nancy radioed that it was too windy on the open water—we took her advice and sailed inside the outermost islands. There was still plenty of wind. 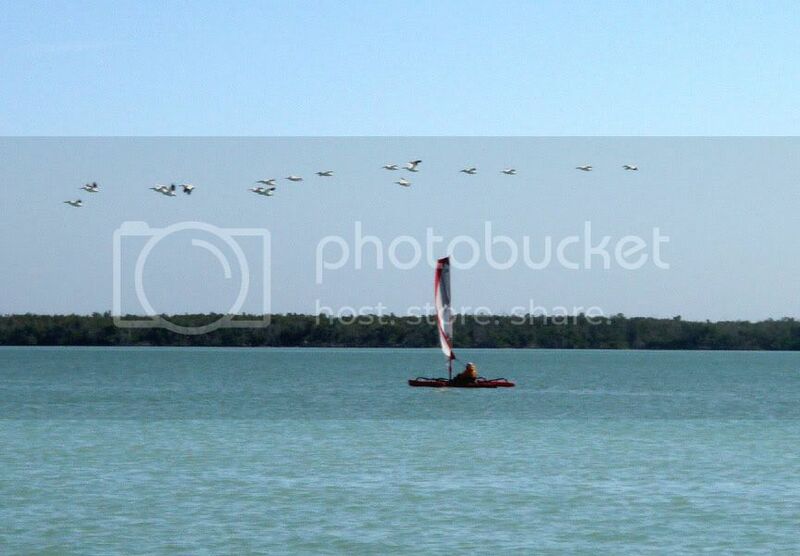 Day 3 we had powerful following winds—our GPS’s registered over 9 mph (about 8 knots) for maximum speed. Today, Day 4, we partially furled our sails and still registered over 9 mph. Bow begins to dive under a wave. On days like this you hope your front hatch is tight. If the front hatch seals (2 of them) are working OK, the front hatch will not leak under these conditions. I do have problems w/ the AI hull design. The AI is a diver. Let me explain what I mean. 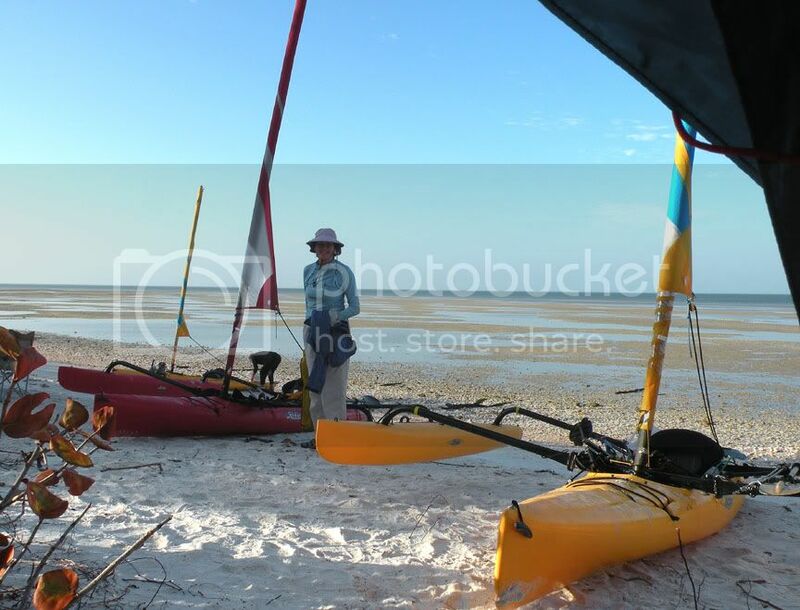 Please check out these sea kayaks and my comments. 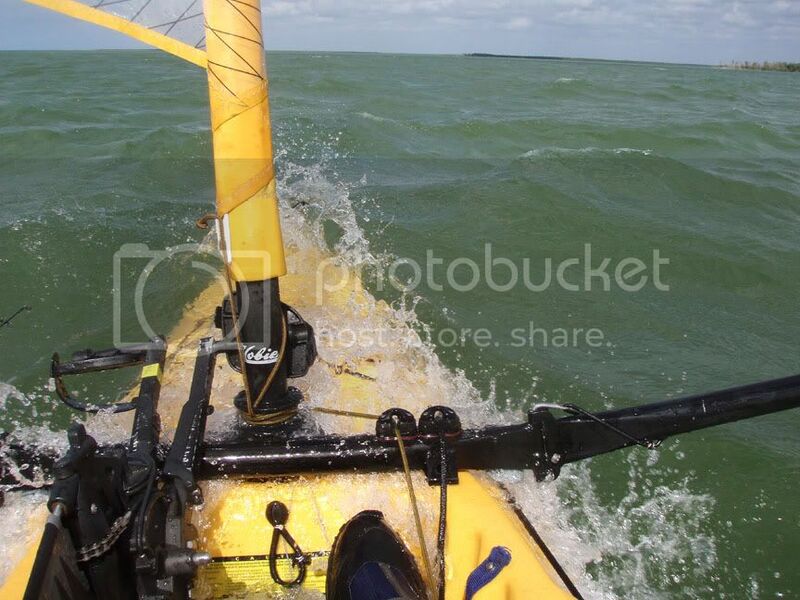 The bow of my white sea kayak would sometimes totally disappear under waves, but it always came back. The AI always comes back also—so far. On both Days 3 and 4, as we traveled downwind, the winds occasionally overpowered our rudders and would send boat and rider careening at 90 degrees to spill out the wind. Each time, it was very exciting for a minute or so. Nancy referred to Day 4 as a “white knuckle” day. 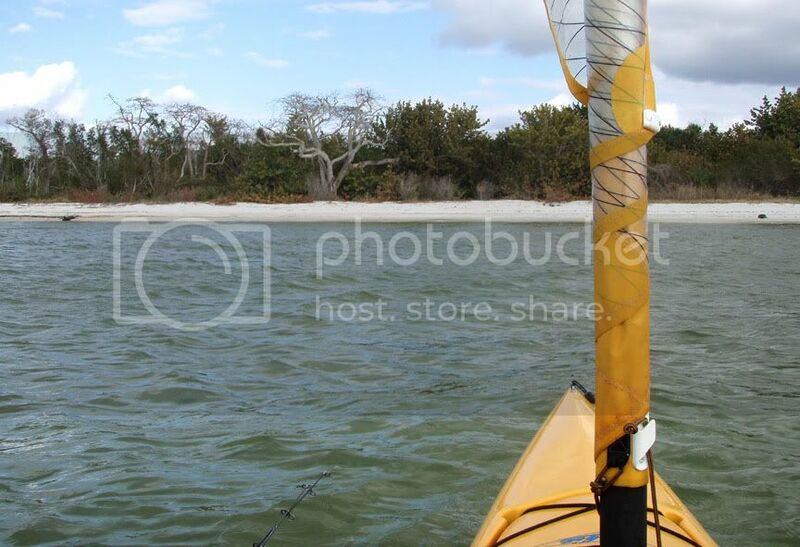 Frankly, she has had several similar days when traveling this coast in a sea kayak, so she handled it OK. I think she was quite proud of herself. I was too! We pass on the inside of a small island as we sail to Pavilion. Nancy enjoying Pavilion. We had tailwinds of 17-24 mph today. It was a fast trip from Hog Key. We spent 2 days on Pavilion before heading to Chokoloskee. To our surprise, NO ONE WAS ON PAVILION KEY! This was a holiday weekend and normally Pavilion would be full of campers (a maximum of 24 people or 4 groups), but no one was here. It was beautiful. It rained much of our first night on Pavilion, Saturday night. Sunday morning opened to fog. Fog obliterates everything to the east/SE of Pavilion. 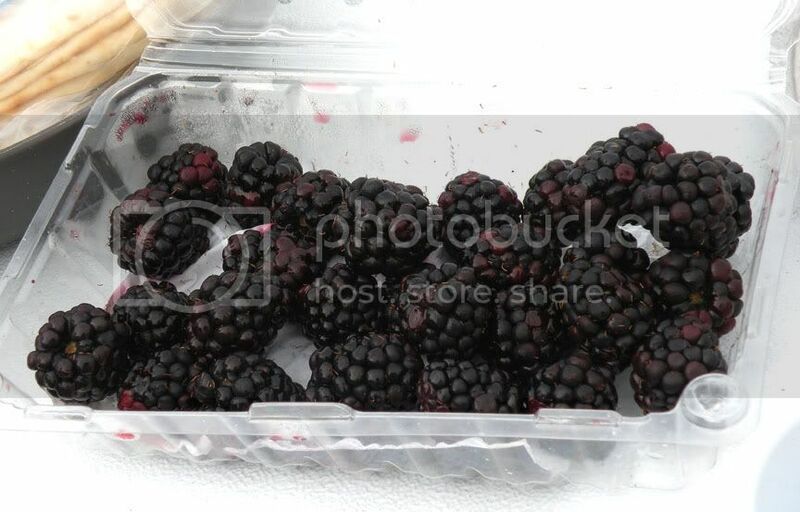 The beauty of carrying a cooler, is that you can have fresh blackberries on Sunday morning, 5 days into your trip. 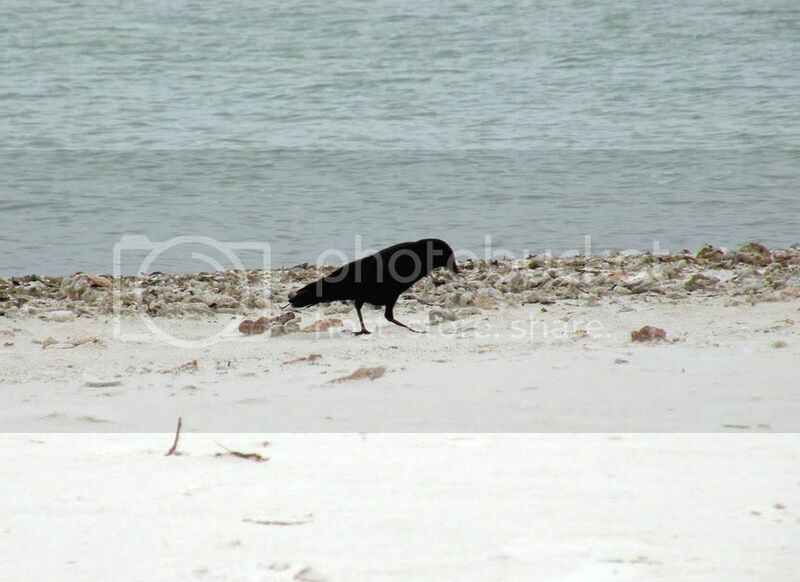 The beach manager is checking beach conditions. 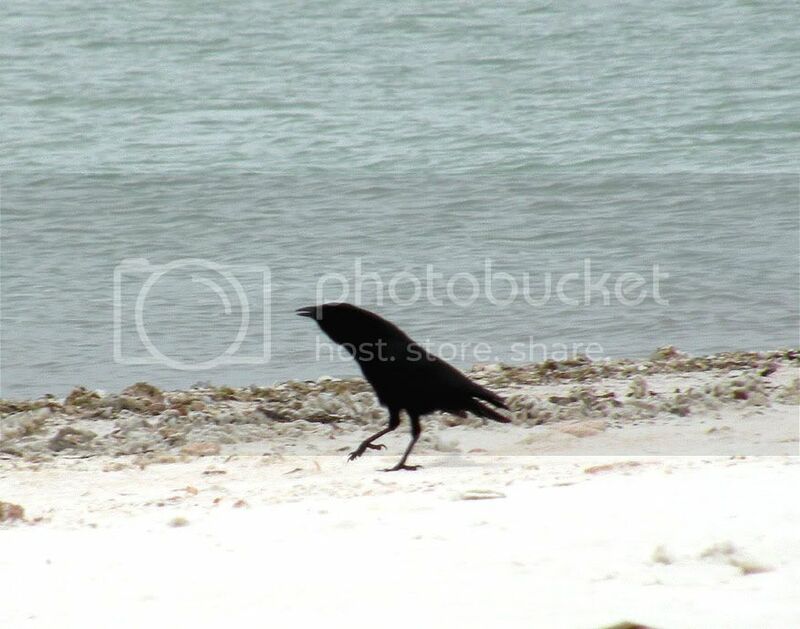 Finding them to his liking, he then crows about it. Day 6: Monday morning off Pavilion. It is warmer and these are some of first birds we have seen. The cool weather even sent most of the birds to warmer places. Nancy leaving Pavilion and headed for Chokoloskee. A flock of white pelicans fly overhead. 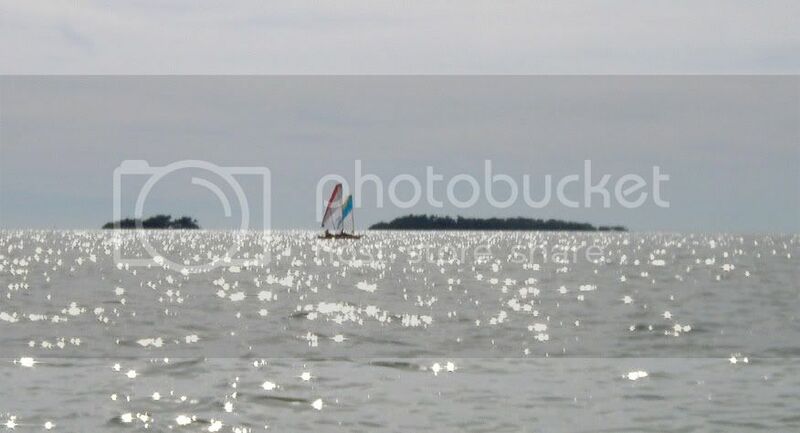 Day 6: This is our nicest sailing day, and the group has become quite independent of one another. A pretty good looking crew after 6 days on the water. Our AIs worked very well; however, the down-line on Nancy’s new boat stopped deploying the rudder on Day 2. I would deploy it by hand as she left shore, then she could lock it down. It could be raised by the up-line. After we returned home, I found that it apparently was binding. All that was needed was to unscrew the main bolt in the center of the rudder housing—just a couple turns—and the down-line deployed the rudder fine. The leakage problem. Fortunately, Nancy’s boat leaked very little. Before leaving home, I lubricated each of the “Twist-n-Seal” hatch rings w/ silicone grease (3 boats, 6 hatches). Each day on the trip, I cleaned Nancy’s and my T-n-S hatch covers and reseated the sealing ring. Nancy’s boat was “dry” the whole trip. My AI was fairly dry (a quart or so of water inside) except on Day 3. On Day 3, my bow was overloaded. I had to push down on the hatch cover to get it to closed—bad move. I had lots of water in the boat, and it undoubted came in the front hatch. Because I forced the front hatch cover down, the back pressure probably made for a poor seal. As the boat dove below the waves (remember, it is a diver), water poured in. Fortunately, I noticed the water when I opened the middle hatch and sponged it out during the day. After that, I made sure not have any back-pressure on the front hatch cover, and I only had the “normal” quart or less of water in my boat. 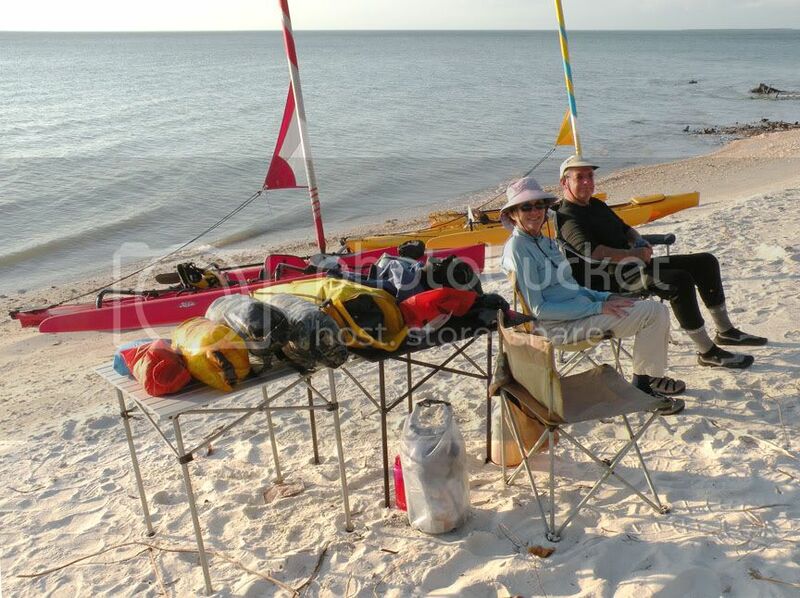 Compare to Sea Kayak Trips. 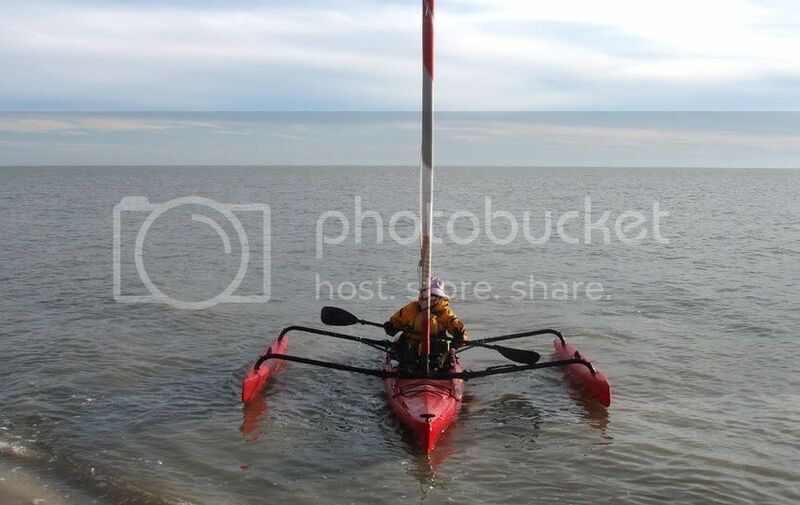 Tripping in a sea kayak is much more reliable in terms of daily mileage. 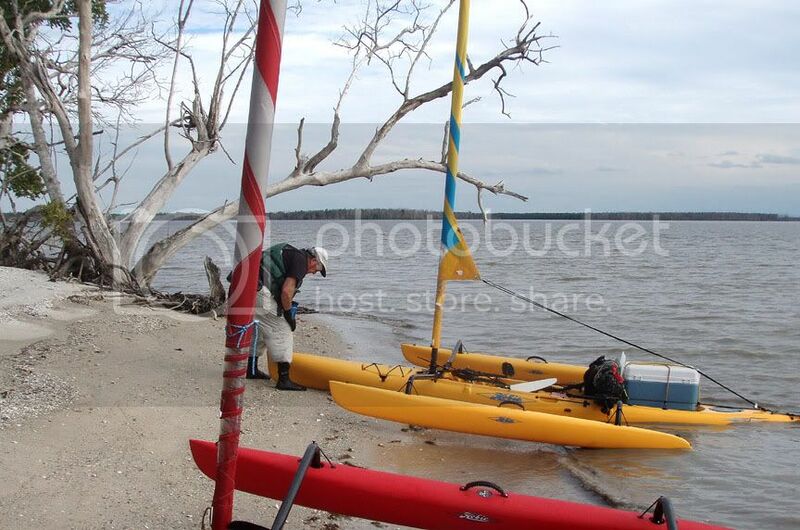 In a kayak, you do your 8-15 miles/day come rain or shine. In an AI, you are always at the mercy of the wind and tides. Best way to describe trip. Given our moderate to strong winds most of the trip, we probably could have made our 20-mi/day if we had gotten an earlier start each day. All in all, it was an enjoyable trip—in a word it was beautiful. Nancy did great on her first AI camping trip. Last edited by Chekika on Fri Jan 29, 2010 6:48 am, edited 1 time in total. Woud love to do it. 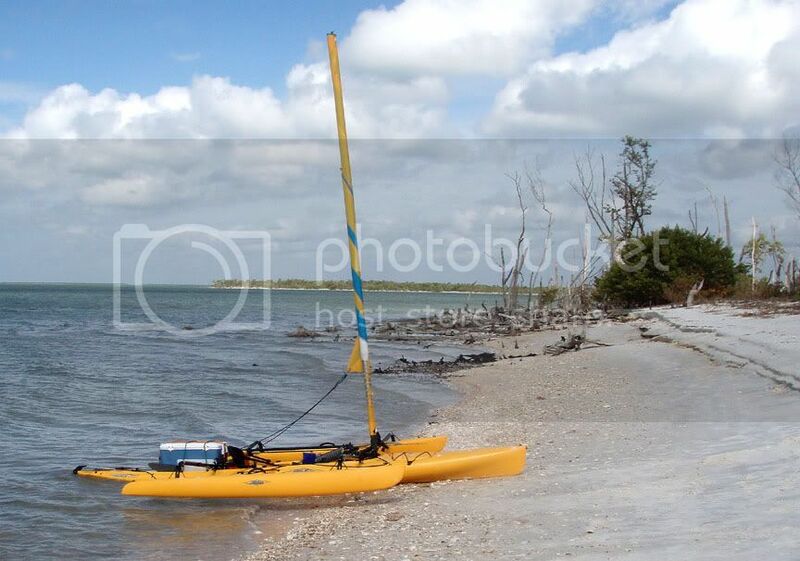 However, your coment on rockerfor sea kayaks is somewhat controversial. 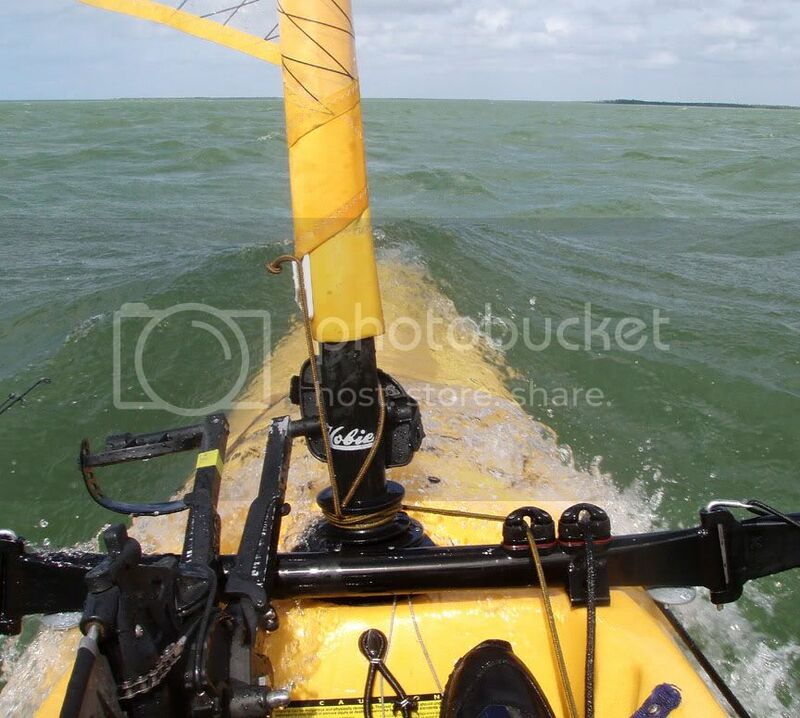 Hobie is closer to Epic then traditional ocean yaks. I suspect your reaction is to the conditions. 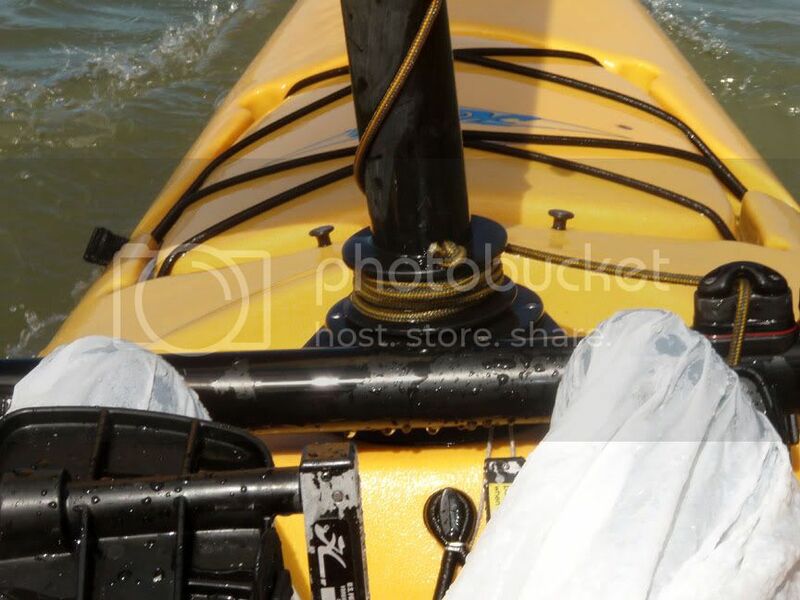 You may have needed Kayaking Bob's spray shield. Thanks for such a comprehensive trip report - now to follow it up with a 10th Mountain Division hut-to-hut ski tour. I also have a friend who was actually in the 10th Mountain Division during WWII. I also recognized the similarity of my Epic bow and the AI, but I did not want to single out the Epic. My guess is that if you put 100+ pounds of gear in an Epic plus a 175-190# paddler, that it would dive, just like the AI does., and just like my original white sea kayak did when I took it on week-long kayak-camping trips. What worries me a bit about the AI is that in the conditions we were in, winds 15-25 mph w/ 2-3 foot chop, when the AI dives there must be extreme pressure on the mast and aka/amas. So far nothing has broken--but it makes me a bit nervous. Someone is sure to say, "furl the sail," (we did on Day 4) but that is not the nature of most of us. Thanks for your comments, AD. They are always appreciated! Last edited by Chekika on Wed Jan 27, 2010 6:36 am, edited 1 time in total. 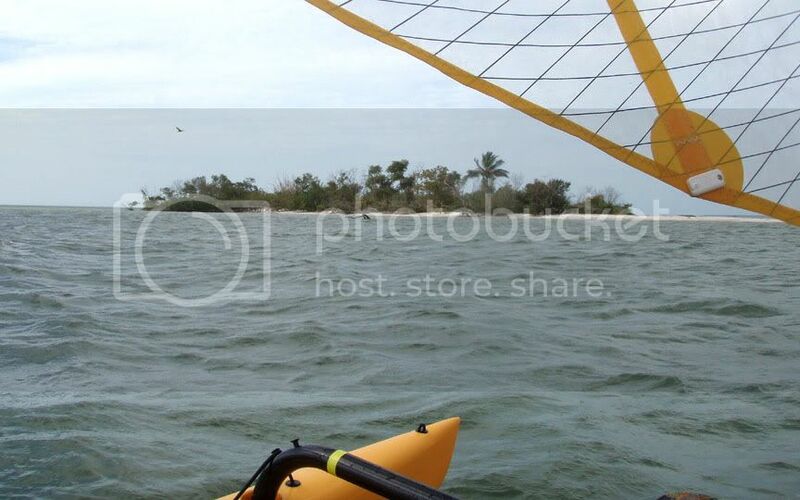 You may have needed Kayaking Bob's spray shield. Yeah, at the risk of being repetitious, Bob's sprayshields are remarkably effective in preventing the bow from submerging. 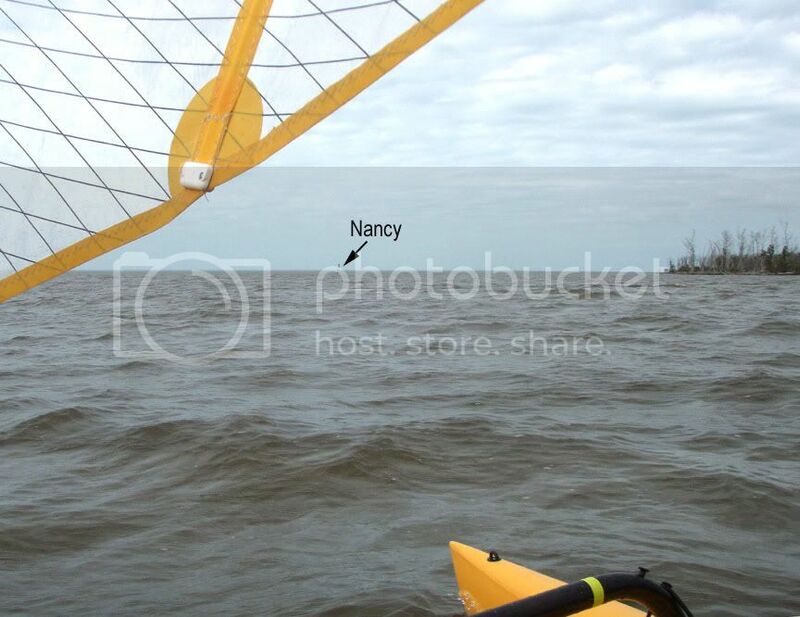 Conditions that made this trip "a white-knuckler", especially for Nancy, was, for the first time, she was far off-shore in high winds and seas--unlike being in a sea kayak in shallow water hugging the shore with trees protecting you from the wind. Point of emphasis must be made on 3 factors: 1) how loaded down we were; 2) high-gusting winds; and, 3) last, but not least, a significant following sea causing constant pitch-poling that drives the bow under for an"Oooh (censored) Scare" that's hard to shake. Keith and I have experience all this before...and its still disconcerting. I keep both sheeting and reefing lines in my right hand ready to adjust the sail quickily in gusting winds...I just hate it when Keith calls on the radio to tell me I'm going off course at the exact time my rudder gets overpowered by gusting wind......... duhh! ......... Stuff Happens!!! Anyway, I'm ready to go again Keith. Can't understand why more people haven't joined us...especially Quirkster. Where are you Quirky! Aloha Dan: You're point about the Epic is well taken...but with considerable down forces on the bow from high-gusting winds on the sail and a fully loaded front hatch, made even worse by a 3'-4' following sea can make for a very tense day. 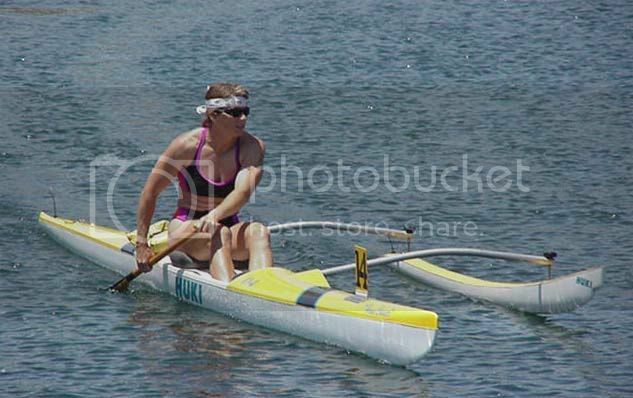 A slight up-turned, flaired bow would help keep the bow for submerging as much...or for as long as it does now. 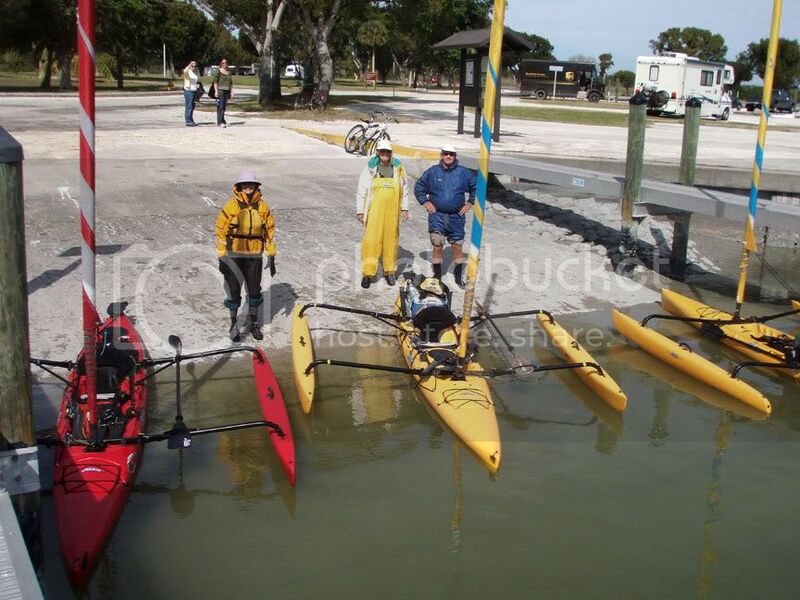 Chrisj: I think you're right about Kayaking Bob's Spray Skirt. Do you feel it keeps the bow from submerging as much. Normally here in Florida the water doesn't cold enough to justify having a sprayskirt on, but if it also helps keep the bow from submerging so much I will definitely add one. Thanks for the suggestion! I'm not completely useless. I can always serve as a bad example. 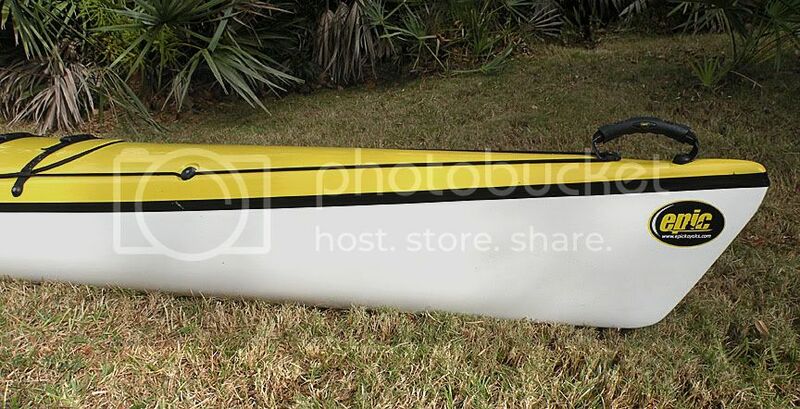 Regarding the "diving" design of the Adventure hull, an outrigger canoe (OC1) is an extreme of this design. These boats are racing rockets: very light, very long, very narrow, no rocker. The hull by itself would be very difficult to keep upright and half the time it would dive below a wave and act like a submarine--none of this is good if you are in a race. So, what do designers of OC1 boats do? 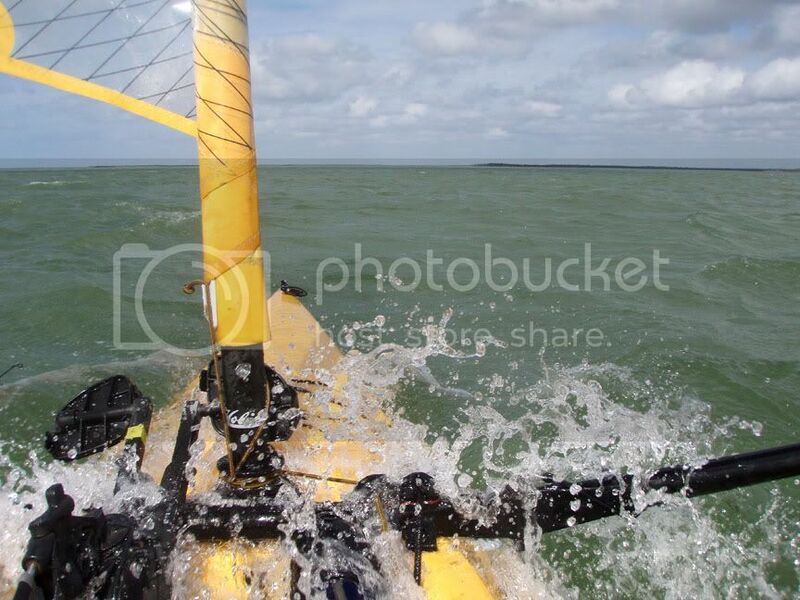 They have a single outrigger designed to keep the boat from diving. Here is a picture of Huki OC1. 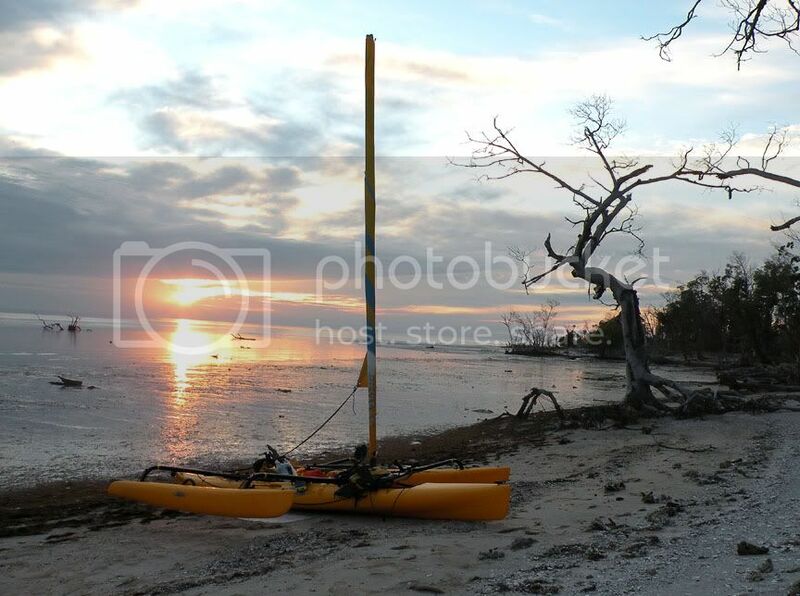 While the hull is designed like a pencil, so it can travel fast over the water, the outrigger is designed to ride over waves and keep the boat from diving. 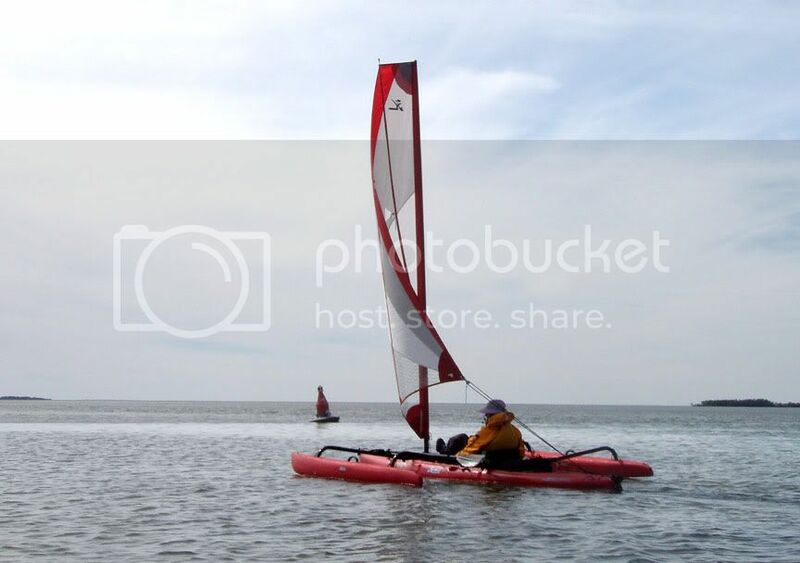 With this extreme outrigger in mind (there are even more extreme outriggers on OC1 boats), Hobie designers could simply redesign the outriggers to somewhat resemble that of an OC1. I think that would solve the diving problem w/ no modification to the hull. 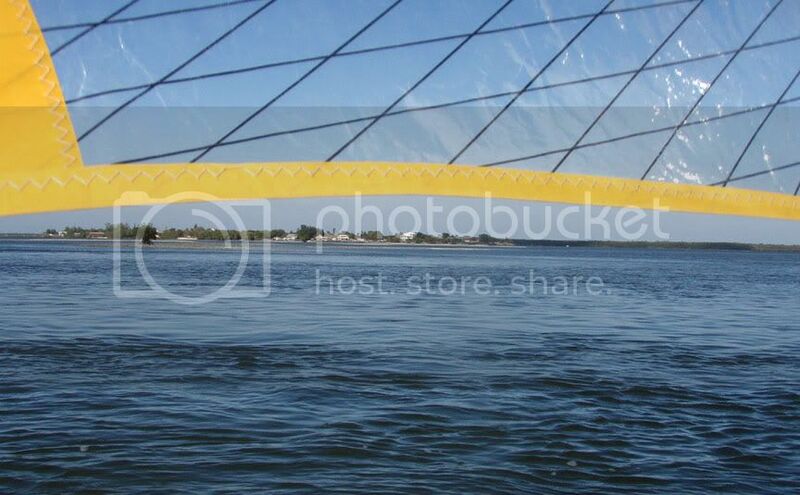 Although the spray shields might reduce the problem, one has to worry--can the bow of the Adventure Island hull withstand the forces we (in our 70-mile trip) were placing on the boat without damaging the point of attachment of the spray shields? Why has Hobie not come out w/ their own spray shield? Are they working on them? Is there some problem with them from their viewpoint? 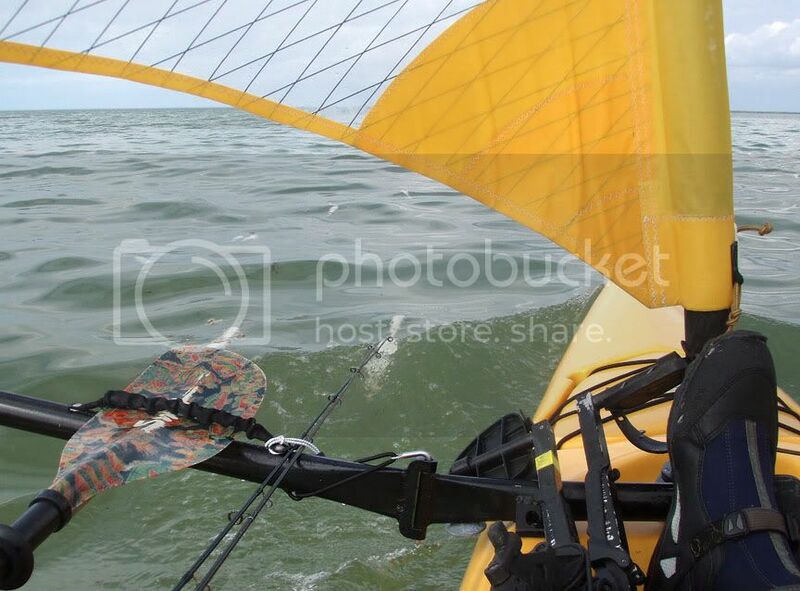 Don't get me wrong, I like the idea of Kayaking Bob's spray shields--they certainly get a 10 for style points--but, I am worried about how they would perform on an AI in the conditions we were were sailing. I would like to see Hobie do the necessary research and come out w/ a spray shield they could stand behind. 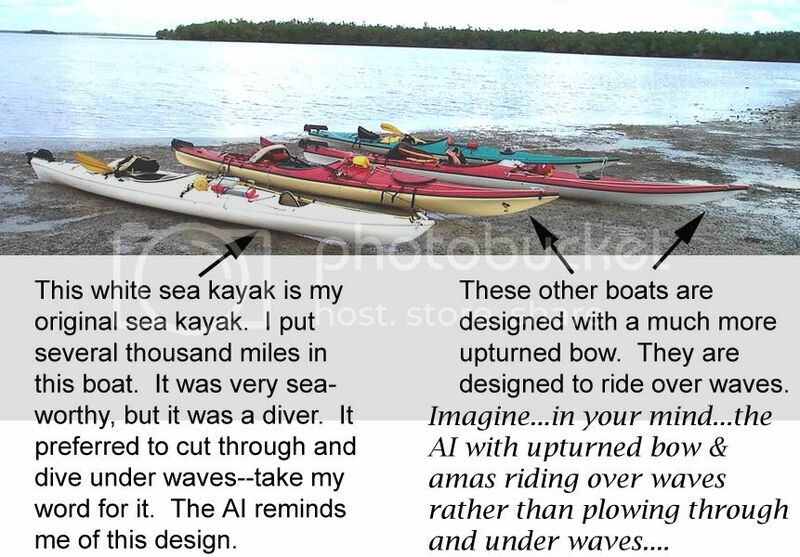 I would also like to see them re-design their outrigger so the AI stays on top of the waves.